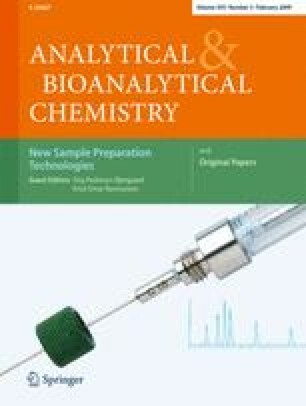 In this work, an analytical method for simultaneous analysis of several quinolones (cinoxacin, oxolinic acid, nalidixic acid, and flumequine) and fluoroquinolones (norfloxacin, enrofloxacin, enoxacin, ciprofloxacin, and danofloxacin) in baby-food samples is described for the first time. The method is based on isolation of these analytes by ultrasound-assisted extraction procedure followed by a solid-phase extraction sample clean-up step and final determination of the analytes by HPLC using UV detection. For the extraction step, 2 g baby food was mixed with methanol in a centrifuge tube and one single extraction cycle of 15 min at room temperature was carried out. After centrifugation, supernatant was collected and two different solid-phase extraction procedures were developed and evaluated for sample clean-up. The first was based on use of strong anion-exchange cartridges whereas the second was based on use of a ciprofloxacin-imprinted polymer. Both sample clean-up procedures had their own advantages and drawbacks, and the analytical performance and applicability of each procedure was established and properly discussed. The anion-exchange resin-based method enabled simultaneous determination of quinolones and fluoroquinolones, reaching limits of detection ranging from 0.03 to 0.11 μg g−1. In contrast, the use of a ciprofloxacin-imprinted polymer did provide selectivity towards fluoroquinolones, leading to chromatograms free from co-extractives reaching limits of detection one order of magnitude lower than those obtained by the first approach. Authors wish to thank Spanish Ministry of Education and Science (AGL2005–00905) for financial support.